I want to attend an Intersolar where a German person doesn’t tell me the U.S. needs a feed-in tariff. Reporting from Intersolar in San Francisco, a large solar show, in a shaky solar market. Attendance is strong and the mood is upbeat at this conference, considering the headwinds against the U.S. solar industry (1603 expiration, trade tariff, NJ and CA support mechanism issues). Today kicked off with an analyst session led by GTM Research Director Shayle Kann which reviewed some of the findings of the U.S. Solar Market Insight report from Q1. Kann said that the U.S. market in 2012 will be 3.3 gigawatts and that the U.S. market will not shrink anytime in the next ten years. He also noted that the U.S. utility solar market has a nine-gigawatt project pipeline of projects in development with PPAs. Tom Starrs, the VP Market Development and Policy at SunPower, presented on Monday on the "U.S. PV Market and Support Mechanisms." He cited a number of forecasts which had the U.S. market at between six and eight gigawatts by 2016. He also noted that 100,000 Americans are currently employed in the $6-billion-plus U.S. solar industry at 5,500 solar companies. Starrs spoke of the 2012 federal election cycle and super PACs contributing tens of millions of dollars to anti-renewable energy campaigns (e.g., Americans for Prosperity spending $12.5 million on an anti-green jobs campaign with TV ads in key battle ground states). All this despite bipartisan polls which show that more than 70 percent of the American public still support government spending on renewable energy. Starrs also said that net energy metering (NEM) continues to be a major market driver in 47 states and several U.S. territories, despite utilities stepping up attacks in an effort to constrain NEM -- with the refrain that NEM shifts cost to low-income customers and contributes to grid integration challenges. The microinverter and panel optimizer contingent was out in full force at this year's show, although Enphase was conspicuously absent from the show floor. Microinverter startup Enecsys is now shipping in North America, with tens of thousands of units installed in 15 countries including Germany. SolarBridge, which has partnered with a striking number of panel manufacturers for AC modules (ACMs) is here and has been seen in a number of module booths. Newer microinverter names include Sparq Systems and APtronic. SMA also showed its microinverter at the show this week. In the optimizer camp, Tigo was showing videos and SolarEdge had a magician -- an Israeli magician. SolarEdge has shipped more than a million units of its optimizer product. 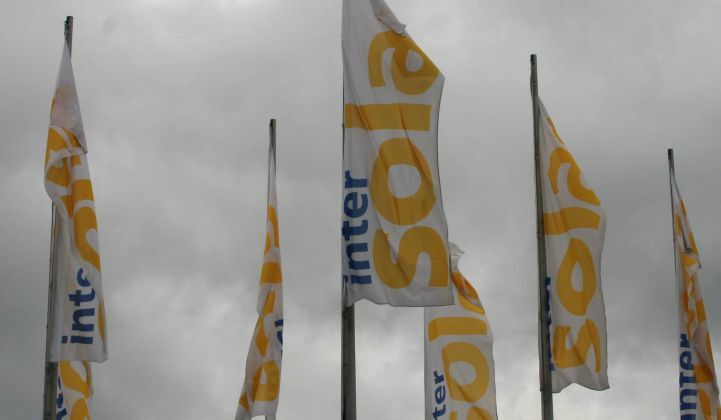 In June, at Intersolar Europe, Shyam Mehta observed an increasing trend of solar products paired with energy storage technologies from vendors such as SolarWorld, Samsung, BYD, Aleo Solar, centrosolar, Bosch/Voltwerk, and Kyocera. Most vendors were focusing on the battery management system, as well as the batteries themselves. Non-Chinese suppliers in high-cost regions were attempting to counter the ongoing commoditization of “plain-vanilla” solar with something, anything, that provides differentiation. The energy storage talk and, to some extent, hype continued in San Francisco this week. We've covered energy storage extensively at Greentech Media: FERC's take on the matter, the California Independent System Operator's viewpoint, a venture capitalist's stance on energy storage, ARRA activity, and the many startups pursuing the application. But for now, energy storage remains mostly talk, prototypes, and demo projects. Xtreme Power does have some megawatts deployed, but mostly in edge-cases like fragile island grids or microgrids. A123 also has some grid-scale storage deployed in edge-cases such as Chilean mining towns. An actual mainstream business case that pencils out and combines solar and energy storage is still some years away and will require technological progress, cost reduction, regulatory reform, and scale. For now, the energy storage tracks at Intersolar were distractions from the serious matters at hand.